The Late Graham Martin’s Green Bus Service (aka Warstone Motors) ran routes in rural Staffordshire. Here is an ex-Burnley Colne and Nelson Leyland Tiger Cub with East Lancs body it was fleet number 66 in their fleet. 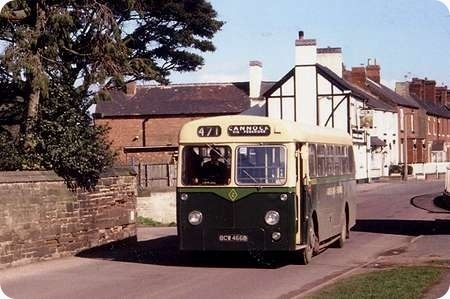 It is seen in this shot leaving the village of Brewood and has just crossed the Shropshire Union Canal. There is an ex-Burnley Colne and Nelson Leyland Tiger Cub for sale in the May edition of Bus & Coach Preservation’ magazine can not see a registration plate suspect it is one from the previous 50 – 59 1963 batch although the advertisement dates the vehicle as 1962. The Company name was Green Bus Service – Knowing Mr Martin I’m sure he would want that corrected. Sorry about that I have updated the posting.